Our Lady of Weight Loss Review: Healthy Choice's Fettuccini Alfredo BAKED! Our Lady of Weight Loss Review: Healthy Choice’s Fettuccini Alfredo BAKED! 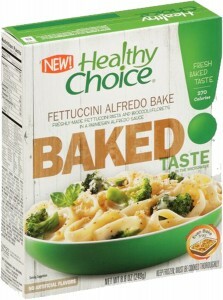 Continuing on my uber-fun journey from the freezer to the microwave to the table to sample and review Healthy Choice meals, today please allow me to focus on H.C.’s “Baked” line of “boxed foods,” with particular emphasis on their Fettuccini Alfredo Bake. The Review: Let’s say that you’ve got a Jones for pasta, but you don’t want to get too tangled in your noodles, if you know what I mean. Then Healthy Choice’s Fettuccini is the dish for you. It weighs in at 270 calories per servicing (the entire box). The sodium count, 580 mg, is reasonable (by comparison; some boxed foods are off the charts 900 + mg). It’s reasonably priced! Somewhere in the $2.49 to $3.49 range (depending on the supermarket and the day of the week—sale day or no sale day). And, bonus people, it is tasty. On the downside, it didn’t feel exactly “baked,” as in crunchy edges. Healthy Choice’s BAKED Entrees Rating: Both Our Lady of Weight Loss and I agreed to bestow 2.65 Yums on your basic day and 2.9 Yums when you’ve got your pasta Jones on!